If you’ve got a large empty box you’re prepared to hand over to your kids then that and the Makedo London Bus Kit are all you need to guarantee a few hours peace and quiet. 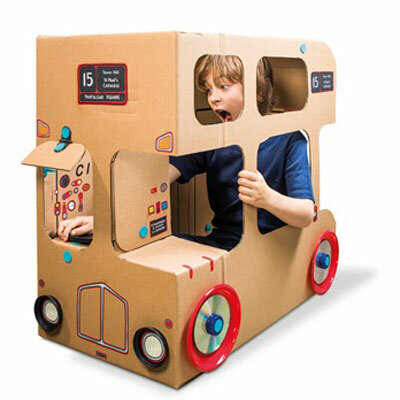 Makedo produce a genius range of products which allow anyone over the age of 6 to recycle an empty box into an imaginative prop. The bus kit contains 57 reusable parts including re-clips (which allow you to clamp materials together), lock hinges (to create joints) and a safe saw to build your own bus and stickers to make it look the part. The kit costs £12.99 and is available form the London Transport Museum Shop here.